ABS industrial pipe systems tend to be chosen over PVC in applications where low operating temperatures are expected, where there is a risk of pipe shatter (such as compressed gasses or impact) or where the chemical compatibility of PVC is unsuited. ABS pipe is quite a ductile material which means that it is less brittle at lower temperatures than PVC. ABS can provide excellent resistance to impact damage at temperatures from as low as -40°C and up to 70°C. It is for this reason that ABS pipe and fittings are the best choice for cold process lines such as chiller circuits with glycol and those carrying ice slurries, such as ice cream and chilled food factories. 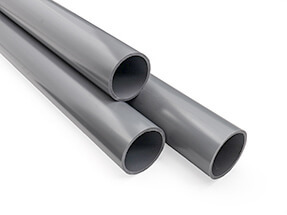 ABS pipe is mid to light grey in colour, as opposed to the dark grey of PVC. Care should be taken when identifying by colour alone, however, as some older PVC (up until the late 1990s) was also manufactured in a light grey. It is also possible to confuse it with Corzan CPVC which is also a light grey colour in the UK and Europe. Other industrial uses: ABS plastic is widely used in many industries due to its properties of ductility (meaning it can deform and then reform to its original shape) and the ability to achieve a very high-quality gloss finish in the moulded product. It is commonly used in items like power tool bodies, phone and instrument cases, car dashboards and Lego®, where the ability to look good and deform to attach one brick to the other, and then reform when taken apart is very important. ABS pipe has a recommended operating temperature of between -40°C to +70°C and so is often the choice of pipe system for cold applications. Unlike PVC pipe, ABS pipe does not shatter at low temperatures. Note, however, that at temperatures above 20°C, pressure derating factors come into play. See the table below. ABS pipe is generally solvent welded using proprietary cement and cleaner products, although threaded fittings and flanges are also available. 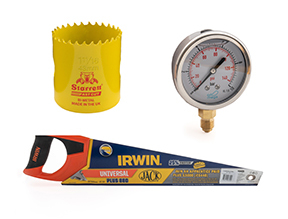 ABS solvent welds together very quickly and so accurate pre-cementing measuring and marking up are essential. Once the joint is made, it cannot be turned or manipulated. ABS pipe has a very smooth bore and is hard wearing which makes it the plastic of choice for abrasive slurries. As with all abrasive fluid applications, it is preferable to keep fittings to a minimum and, where possible, use bends rather than elbows. ABS pipe is designed to be a rigid product. Although there is some flexibility in a long length of pipe, it should be regarded as rigid and not flexible. Unlike PVC pipe, ABS pipe does not build up static electricity, which is why, along with its excellent impact resistance, it is a plastic of choice for power tool bodies. This quality makes it suitable for blown air where, in a material such as PVC, small particles in the air can cause a build-up of static resulting in arcing to earthed objects, including people! All of our ABS pipe systems are WRAS approved for use with potable water systems in the UK. Whether or not a material is "food safe" depends on the nature of the food. Some foodstuffs, especially when in concentrated form, can be quite aggressive. Our recommendation is to consult the ABS Pipe Chemical Resistance Tables on our website. If you are still unsure, contact us and we will be happy to assist. ABS pipe has a good resistance to weak acids and most alkalis. For more details please consult our ABS Pipe Chemical Resistance Tables or contact our office for more assistance. 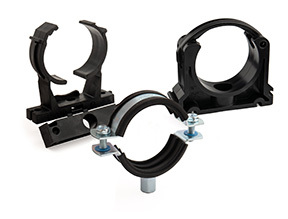 The correct spacing of pipe supports is important in an ABS pipe system installation. The recommended spacing changes with pipe diameter and temperature. Please consult our ABS pipe spacings table below, remembering that additional support will be required around elbows, heavy fittings such as valves and other equipment. All our ABS pipe systems conform to all relevant UK standards for sizing of pressure pipe systems. 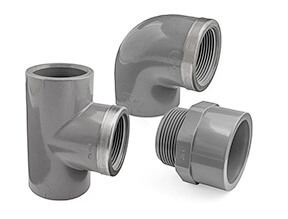 It is important to note, however, that ABS pressure pipe is not size compatible with ABS waste or drainage pipe used in sink or bathroom-type applications. See Imperial ABS Pipe Dimension Tables. Metric ABS is only manufactured by one company and so is far more expensive than imperial (inch) sizes. We can supply this but do not list it on our website. As temperature increases, the pressure rating of ABS pipe decreases. See Pressure Derating Table for how to calculate. • Flanges or threads are often used to join the ABS pipe to other materials (such as brass or other metals and plastics) and to connect to equipment such as pumps, blowers, filters etc. • Solvent welding is the process used for the majority of the ABS pipe and fittings. With solvent weld, a "glue" is brushed onto the cleaned fitting and pipe and the two are then pushed together in one swift movement. The joint is very rapidly made and there is little room for any rotational movement of the fitting, once pushed together. The rapid reaction of ABS pipe and fittings to the solvent cement is often something as a surprise for industrial pipe fitters who are more used to working with PVC Pipe. The latter gives a window of a few seconds, when the fitting can be turned and lined up; however, with ABS this window is reduced to almost half a second. It is therefore vitally important that pipes are properly measured, and that both the ABS pipe and fittings are properly marked prior to gluing together. ABS pipe systems can be assembled dry as a trial run, but ensure that they have not been cleaned with any solvents or cleaner first. The cleaner will key and soften the plastic and make it almost impossible to disassemble. Our ABS pipe systems are generally manufactured by: Polypipe Italia - Effast and Plimat. ABS pipe is generally manufactured in imperial sizes only. There is one manufacturer who supplies industrial metric ABS pipe pressure systems, but these tend to be far more expensive than inch sized systems and are not widely used. 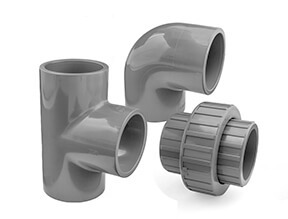 At Plastic Pipe Shop Ltd, we are able to supply metric ABS pipe and fittings from this manufacturer but do not list them as standard items to avoid confusion in ordering. The imperial (or inch) measuring system used in ABS pipe and fittings is based around an approximate bore (internal) measurement of the pipe. Some first-time users find it very confusing as the "name" of the pipe, such as 2″, does not actually relate to any specific measurement found - 2 inches measures 50.8mm, but neither the internal or external diameter of the ABS tube measures exactly that. The classification system is just letting you know what the approximate internal diameter of the ABS pipe is. The distances between ABS pipe supports shown below are minimum recommended values. 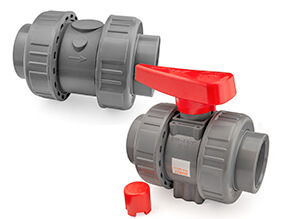 Additional support should always be added to an ABS pipe either side of valves or equipment, especially if they are heavy, and also either side of horizontally mounted elbows and bends, as these will have a tendency to put stress on the pipe if not properly fixed in position. 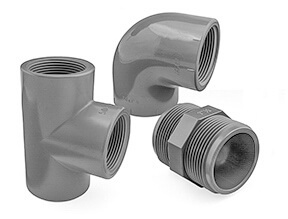 The aim of supporting plastic pipes is two-fold: firstly, to prevent the pipe from sagging, which may end up with debris settling in the low parts and/or air collecting in the high parts; and secondly, to remove any stresses on the pipe that, if left unsupported, could result in the failure of joints and fittings. All our plastic ABS pipe products are WRAS approved. WRAS is the acronym for "Water Regulations Advisory Scheme" which is an organisation that collates test results of materials and products for suitability with drinking water supply use from several different accredited laboratories. If the tests show that the requirements have been met, WRAS will award a certificate. Only WRAS approved materials and products can be used in potable water systems in the UK. 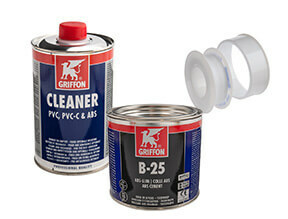 •1406502 - Griffon ABS Solvent Cement Range. Original ABS pipe pressure rating multiplied by the "De-Rating Multiple" below equals the true pressure rating at the specified operating temperature. For example, a 9 bar pipe operating at 40°C will be 15 x 0.81 = 7.29bar. Where Can I Find ABS Pipe Near Me? ABS pressure pipe is a specialised type of plastic pipe, and you will not find it in DIY or plumbing stores (including the trade type ones). At Plastic Pipe Shop Ltd, we are a specialist supplier and stockist of ABS pipes and fittings, and can deliver to almost anywhere in the UK with a next day or morning service. If you are unsure of your requirements please call our highly experienced customer service department on 01786 472850 and they will help you find the best solution.